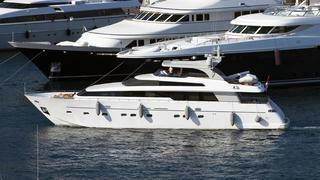 The 26.75 metre motor yacht Kavalier, listed for sale by Moran Yacht & Ship, has had a further €300,000 price cut. Built in GRP by Italian yard Sanlorenzo, she was delivered in 2010 as a Sanlorenzo 88 model and has only been used privately by one owner since. She offers spacious accommodation for up to nine guests in three staterooms plus one convertible office cabin, along with space for four crew. The accommodation is configured as an aft master suite with a walk-in wardrobe and large hammam shower, a full-beam VIP stateroom, a starboard twin cabin with a Pullman berth, and an office to port which could be converted into a double cabin. All guest staterooms have en-suite facilities finished in yellow onyx. Her interior, designed by Franco & Anna Della Role, features varnished wood panelling and beige and brown furnishings to create a masculine and relaxed feeling. Kavalier has lavish exterior spaces including a large flybridge with teak chairs and tables, a shower, bar, sun pads and a Teppanyaki grill, while the expansive aft deck has all the amenities required to enjoy al fresco entertaining and dining. Twin 1,902hp Caterpillar C32 DITA engines give her a cruising speed of 23 knots, a top speed of 28 knots and she is fitted with zero speed stabilisers. Currently lying in Viareggio, Kavalier is down from €3,600,000 to €3,300,000.